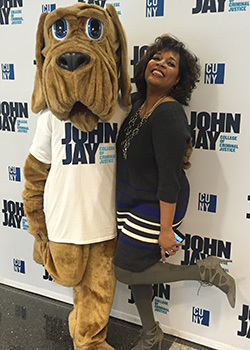 John Jay College of Criminal Justice is home to a vibrant and diverse community, including a student body filled with some of the most remarkable advocates for justice in the nation. The Division of Student Affairs is proud to serve these students, providing avenues for involvement and development that enrich their college experience and help to prepare them for successful futures. We believe in supporting our fellow bloodhounds, and strive to provide resources and guidance that facilitate growth in areas like leadership, teamwork, communication, social justice, civility, critical thinking, and healthy living. These essential skills extend beyond traditional classroom learning, and Student Affairs staff members are eager to help each of our students navigate these aspects of their education. Our division is home to a number of valuable campus services – including a Wellness Center that promotes a holistic approach to health and the Center for Student Involvement & Leadership (CSIL), which supports more than 60 student clubs and organizations. Whether our students are seeking involvement through one of these avenues, joining an athletics team, connecting with cohorts in the Urban Male Initiative (UMI) program or Office of Military & Veteran Services, volunteering for good causes with the Office of Community Outreach & Service Learning, attending a job fair from the Center for Career & Professional Development, or simply participating in an activity sponsored by any of the 15+ offices under the Student Affairs umbrella – we are here to make their experience worthwhile. We know there is a place for everyone at John Jay, and together, we are committed to helping every student find a niche where they can thrive.